NatWest Bank has announced the closure of their branch in Ampthill from 13th June 2017. The Bank is the only one in our town and serves 7000 Ampthill residents and also those in surrounding villages. Ampthill Town Council has learnt that Nationwide reacted to a similar case in Glastonbury, Somerset by setting up a branch in the town, after the community showed their support for the idea in huge numbers. So please sign this petition to show your support, so we can demonstrate to Nationwide that setting a branch in Ampthill would be most welcome. Nationwide can be contacted at customer.services@nationwide.co.uk with your emails of support for the idea. 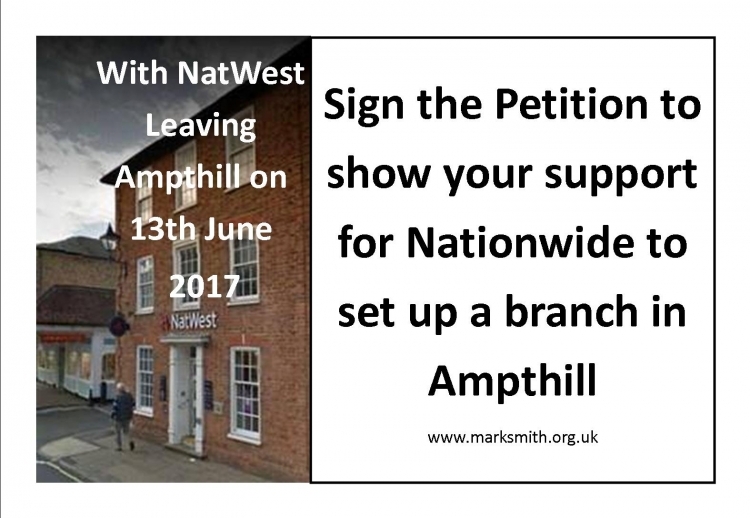 The Sign the Petition to show your support for Nationwide to set up a branch in Ampthill petition to Councillor Mark Smith (Ampthill Town Council) was written by Ampthill Town Council and is in the category Consumer Affairs at GoPetition.